Tim Hudak's leadership may be brief. Tim Hudak is discovering the uncomfortable facts of Tory life, facts that earlier Conservative leaders, federal and provincial, had to learn, painfully, in their day. Out of power, Tories are less a political party than a dysfunctional rabble, seething with individual ambitions and personal agendas. After winning only two in five seats, Wynne needs to change the channel. The jury is still out on Ontario’s Liberal Premier Kathleen Wynne. That much, at least, seems clear from last week’s provincial byelections. The Liberals went into the fray with five seats, all held by former cabinet ministers; they came out with just two. When she became leader and premier early this year, Wynne faced two challenges. The first was to make a clean break with her predecessor, Dalton McGuinty, with his administration (of which she had been a part) and with the legacy of mismanagement and scandal he left behind. The second was to demonstrate that she and her administration represent a new game in town. Harperites act as though they'd never win another election if the voters know what they know. More often than not, the Harper Conservatives are their own worst enemy. They have only themselves to blame if they are seen by the public as being secretive, controlling, dissembling and hypocritical – even paranoid. Re-positioning of senior ministers shows Harperites' priorities. The removal of Cambridge MP Gary Goodyear as minister of state for science and technology in last week’s federal cabinet shuffle slipped beneath the radar of the national media. That’s partly because the science portfolio has never assumed any importance in Stephen Harper’s universe. (This may seem odd, given the Conservatives’ emphasis on economic development, but it’s not the only peculiar priority in Ottawa these days.) It’s also partly because Goodyear, a strong constituency member, has never managed to make himself more than a marginal player in the capital. 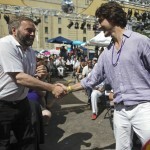 Trudeau's personal popularity gave party a bump; policies the necessary next step. The Justin Trudeau honeymoon is over. The surprise is not that the romance has cooled. It’s that it was so intense, lasted as long as it did, had such an uplifting effect on sagging Liberal fortunes and, in the process, re-ordered the balance among federal parties. The Ontario byelections: harbingers or just five small potatoes? Byelections can be a really big deal — or they can be small potatoes. They can mean everything, or nothing. They can be a harbinger, or a footnote. Pam Wallin's story does not make sense. Folks, it is time, past time, to shed a sympathetic tear or two for the much maligned members of the senior house of Parliament, the chamber of sober second thought, where wisdom takes precedence over partisanship. I speak, of course, of the Senate of Canada. Recent events have not been kind to senators. Pity poor Mike Duffy (“Old Duff,” as he likes to be known). He was so busy to keeping the country safe for Conservatives that he forgot where he lived, ended up with a $90,000 bill for living allowances, and had to go cap in hand to the Bank of Harper (Nigel Wright branch) to bail him out. 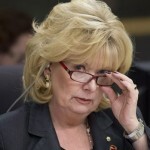 Shed a tear, too, for another Conservative senator, Pam Wallin, who, as we learned just last week, has been far too busy in her four-plus years in the upper house to find the time to vote in any election, federal, provincial or municipal. Departing Liberal leader would make a dandy Governor-General. There are some politicians — not many, but a few — who command near-universal respect, admiration and, yes, affection, even among their opponents. Bob Rae is one of that rare species. He is resigning his seat (Toronto Centre) in the Commons, and Parliament and the Liberal party will be the poorer for his departure. “Little Things Mean a Lot,” as Kitty Kallen sang in the sappy love song that topped the Billboard chart for nine weeks back in 1954. (Blow me a kiss from across the room/ Say I look nice when I'm not. … Arghh!) Treacly though the song is, the sentiment ought to be a mantra for Canadian political leaders in 2013. Watergate's legacy of public distrust taints once-smug Canadian governments. It may seem like yesterday, but it was 40 years ago this summer that the notorious Watergate scandal burst on our consciousness.